In this sitcom, an ordinary American mother tries to navigate her ordinary life. It's not easy, given that she has to deal with her sometimes-difficult husband and children. Fortunately, she has a sense of humor about the whole thing. Now that Frankie knows Axl was offered a job in Denver, she makes it her mission to sway him from taking it and moving away. Meanwhile, the usually overly optimistic Sue is depressed over Sean leaving for Ghana, without ever expressing her feelings for him; and Brick drives everyone crazy when he buys a huge amount of lawn chairs to replace the one he's been using for nine years. In an attempt to get Frankie the best Mother's Day gift ever, Sue and Brick enter a trivia contest where they could win a trip for two to London for the upcoming royal wedding; and Axl is offered a job interview that could change his life. Frankie has to force Brick into asking Cindy to the high school prom but worries that his quirkiness could spoil the happy event; Lexie talks a clueless Axl into giving Sue a belated 21st birthday present; and Mike becomes frustrated over how to get used to a new TV remote. Frankie is surprised but relieved when Dr. Goodwin agrees to buy all of the peanut brittle that Brick needs to sell for school. But the good doctor displays a bit of Mr. Hyde behavior when Frankie doesn't deliver the product in an expeditious manner. Meanwhile, Axl is getting sick and tired of having Mike tell him how to run his life; and things go off the rails when Axl attempts to trade in the Winnebago and buy a car. Sue is more determined than ever to win a very prestigious and competitive hotel scholarship; and Frankie swears that she's seeing something mysterious flying through the house. While Frankie feels the need to have a good cry after having a bad week, Mike shares the good news that, after 25 years as manager at the local quarry, he is being offered the job of regional manager but feels uncomfortable saying goodbye to his co-workers. Meanwhile, Brick suspects that he's being treated unfairly by his health teacher because of how horribly Axl treated her back when he was a student. Things don't go as smoothly as planned for the Hecks when Frankie helps Sue celebrate her 21st birthday by taking her to a bar close to the college, Mike begrudgingly accompanies Brick to a "Planet Nowhere" convention, and Axl and Hutch head to Ohio in the Winnebago to attend and make a toast at ex-college roomie Kenny's wedding. Axl heads to Chicago to visit Hutch for the weekend but discovers that his friend, who has his own apartment and a job, is now acting more like a responsible adult than the free-spirited college student he once knew. Meanwhile, Sue's excitement over having the apartment to herself over the weekend turns to horror when she is unable to sleep after watching "Silence of the Lambs"; and Brick enlists Frankie and Mike's aid to help convince Lilah, a new student who doesn't know anyone at school yet, that she and Brick would make a cute coupe. The Hecks take a hectic road trip for Thanksgiving to Frankie's sister's house but soon find themselves running into barriers that could make them late to the feast; and with Axl now working with Sue and Brick at Spudsy's, they have been informed by their manager that, due to budget issues, one of them needs to quit, and they must decide amongst themselves which one will take the hit. Frankie is tasked with being at her mom Pat's beck and call when she has to stay for a few days at the Heck house after coming down with an ailment. Meanwhile, just when it looks like Sean is about to ask Sue out on a date, Sue nervously blurts out that maybe they should both try to set each other up on a date with one of their friends; and Axl and Brick ponder what it is exactly that Mike does at the quarry,. Lexi's wealthy parents have dinner with Mike and Frankie, who worry about their humble lifestyle. Meanwhile, Brick is excited about taking part in the Sophomore Slammer fund-raiser, but the event doesn't go as he planned. After Frankie gives neighbor Nancy Donahue an old scarf that is just sitting around gathering dust, Nancy returns the favor by baking her a delicious apple pie. Believing she's stumbled upon a way to get free and tasty meals, Frankie makes it her mission to find miscellaneous items around the house to give to her in exchange for some culinary delights. Meanwhile, Sue and Lexie prepare to move back into their college apartment but find that it's been sublet to a man who refuses to leave; and Axl's new job as the school bus driver gives him a chance to see how Brick's high school sophomore year is treating him, and he discovers that Mike has refused to speak to Brick's class on Career Exploration Day. Frankie frantically searches the house for Axl's graduation gift, which she bought months before and hid; Sue decides that she wants to make a sweet video for Mike's upcoming birthday - even though the family warns her that he probably won't like it; and after Cindy embarrasses Brick by strong-arming and chasing away a boy who was bullying him, Brick turns to Axl to help get him into shape so that he can stick up for himself. When Frankie discovers Axl doesn't have appropriate attire for business interviews, she convinces him to let her take him shopping. Meanwhile, Mike threatens to get rid of the summer pool if Sue and Brick don't use it. Upon their realization that Brick was never confirmed, Frankie and Mike send him to Reverend TimTom's Wilderness Jesus Jam weekend camp to brush up on his religious knowledge before the scheduled event. Mike's friendship with Bill Norwood is threatened after Mike poaches his plumber at a reduced rate; Frankie is offended when Sue refuses to tell her who she has a crush on; Brick wants Axl to party with him at college. Axl begins to question love when he encounters nearly all of his former flames at a St. Patrick's Day party; Brick buys an old microfiche machine at a library sale, leaving Frankie and Mike less than thrilled. Lexie joins the Hecks for their spring break and divulges to Sue that she has a crush on Axl; Mike hires Coach Babbitt as a ringer to help the quarry softball team; Frankie tries to figure out the root of an underhanded comment. Frankie tries to persuade Mike to go to the dentist; Mike tries to convince Frankie he's fine; Axl, Hutch and Kenny decide to sell the famous Winnebago. When the Heck's basement floods, Frankie and Mike can't seem to stop bickering. Axl, Sue and Brick decide their parents need an intervention. Frankie becomes sad when her doctor informs her that her ovaries are shriveled up, which means her days of having kids are over. In an attempt to cheer her up, Mike offers to have him and Frankie babysit the neighbor's baby overnight, which puts some perspective on being an older parent. Meanwhile, Sue and Axl are a bit shocked when romantic sparks fly between Sean Donahue and Sue's roommate Lexie; and Brick tries his best to hone up on his font knowledge when he meets Gibson, a worthy font opponent. Axl has a moment of panic when he realizes he only has four months of college left before he graduates, and he hasn't sent out any resumes. Meanwhile, Brad decides to lead Sue's no-cut a cappella group as they enter a music competition. Frankie is thrilled when she wins a free maid service for a month, but the Heck household could mess things up for her; Mike and Rusty's dad, Big Mike, begins to have trouble taking care of himself. The Hecks are determined to escape the Orson Escape Room on New Year's Day and beat the Donahue's record of getting out with more than one minute, eight seconds to spare. With Christmas just around the corner, Sue keeps a holiday secret from the family; after agreeing to watch the neighbor's three kids, Brick tries to avoid them when they keep asking him to come over to play. Trashy neighbor Rita Glossner convinces Frankie to take a road trip to an unknown destination; Mike is humiliated when he falls at the quarry and has to deal with OSHA. Frankie is upset that Axl refuses to answer her calls or texts after she unintentionally admits her true feelings about his girlfriend April; Brick forms a tick in the form of a phrase that causes him trouble; Brad surprises Sue. Frankie decides that April isn't worthy of Axl and attempts to keep her out of the annual family Christmas photo. Meanwhile, Axl announces that he will be spending Thanksgiving with April. Frankie and Mike's guilt over forgetting Brick's birthday transforms into fear when they realize it's time to teach him to drive; Sue finds out about one of Frankie's secrets. Sue seeks help from Axl about how to break up with her boyfriend; Brick's attempts to make friends in high school are ruined by his best friend, Troy; Frankie incidentally buys underwear with a lewd graphic. On Halloween Frankie finds out that if she and Mike were to get divorced, all the kids would choose to live with Mike. Meanwhile, Sue is on a mission to get her room back from Brick. In the eight season premiere, Frankie and Mike are thrilled to finally meet Axl's true life, Apri. Meanwhile, the family is surprised when she reveals an unusual personality trait. The series will end after nine seasons. 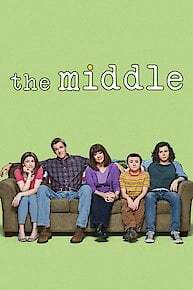 The Middle is currently available to watch and stream on ABC. You can also buy, rent The Middle on demand at Amazon, Vudu, Freeform, FandangoNow, Google Play, iTunes online.